Enjoy the beautiful sunsets in the Pacific Pearl, from the pool, the beach club or from the comfort of your terrace. 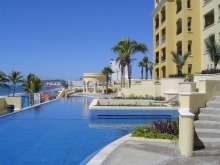 Las Gavias Swimming Pool has more than 12,900 sq. ft., sun decks and a spectacular ocean view. The main pool has been designed with an infinity view where the water and the sea join with the horizon. Wadding Pools. Thinking about the little ones, we have included wadding pools next to the main pool for a quick small dip. Beach Club and Snack Bar Enjoy one of the best beaches of Mazatlan in our exclusive Beach Club with an underground passage, palapas, snack bar, lounge chairs, private bathrooms and controlled accesses.